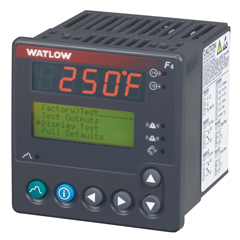 Watlow's SERIES F4 controllers offer high performance PID control tailored for environmental chamber or furnace and oven applications. With one or two loops of control, along with industry leading control features, including cascade, differential, and ratio control, Watlow's SERIES F4 controllers are ideally suited for your most demanding control applications. Note: The specifications in the table above are best available values in each category. Not all combinations of these values are available in a single model number. Sign up for any newsletter on this page for free!